Synopsis: Alcoholic ex-football player Brick Pollitt (Paul Newman) and his sexually-frustrated wife Maggie (Elizabeth Taylor) are in Mississippi to celebrate the 65th birthday of Brick’s father Big Daddy (Burl Ives), who’s dying of cancer. With Brick’s brother Gooper (Jack Carson) and mean-spirited sister-in-law Mae (Madeleine Sherwood) sucking up to Big Daddy and Big Momma (Judith Anderson) in order to inherit the wealthy cotton tycoon’s land, Maggie is desperate for Brick to do something to convince his father he’s worthy of taking over the family estate. However, Brick has more on his mind than his father’s will — mainly the recent suicide of his best friend, Skipper. 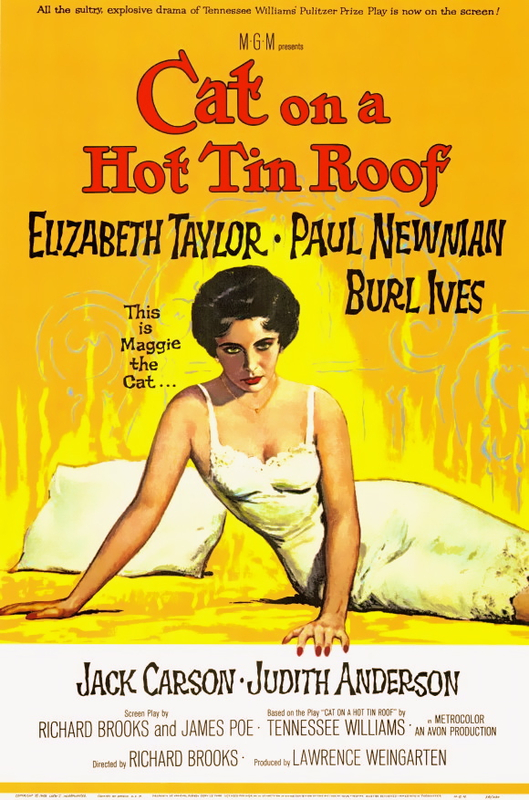 Directed by Richard Brooks for MGM in 1958, Cat on a Hot Tin Roof was adapted from the 1955 Tennessee Williams play of the same name. Despite the film’s enormous commercial success and six Academy Award nominations, both Williams and its star Paul Newman expressed dissatisfaction with the play’s translation to the big screen. In fact, Williams actively encouraged people waiting in line for the film not to see the movie, because he was so personally offended at the film’s bowdlerized bastardization of his work. Broadway has always given more leeway to “controversial” works and writers than Hollywood has, which is exactly the case with Cat on a Hot Tin Roof. Williams intended Cat to be his personal treatise on the destructive effects of internalized homophobia on the human psyche; but with such a taboo subject at the heart of the story, the Hays Office would only allow homosexuality to be subtextually hinted at in the screen version. Therefore, with its core principles remaining unspoken, the film does not have the same impact as the play, and the message is watered down. Brick is only allowed to hint at what the play frankly proclaims and discusses, mainly the possibility of a homosexual romance between Brick and his dead friend Skipper. Pardon my lateness with today’s Friday Glam Spam, darlings — it’s the first one I’ve posted in quite a while, anyway — but I’ve been busy preparing a very special surprise for all of you. In honor of the incredible, the beautiful, the talented, the magnanimous, the all-around Glamorous-with-a-capital-G, Elizabeth Taylor (February 27, 1932 – March 23, 2011), I wanted to go the extra mile and share with you something truly unique and exceptional. Since I happen to collect movie magazines from the 1950s and ’60s, there is obviously a lot of material on Ms. Taylor in my assortment — not all of it flattering, but hey, that’s history — so I’ve scanned a few of the articles and photographs and posted them here for your perusal. I’ve tried my best to leave the text legible, but my scanner isn’t known for its quality, so apologies if things are a bit fuzzy around the edges. There’s a lot of material here, and a lot of work went into scanning and editing it, so please do enjoy. First up is the glossy “souvenir book” for the 1963 epic masterpiece Cleopatra, in which Ms. Taylor plays the titular queen.